Waikato’s Professor John Gibson last week delivered at Motu what has to be the most devastating critique of the empirical estimates on sugar tax effects that I’ve yet seen. Gibson’s slides are here. Minister of Health Jonathan Coleman has been holding off on sugar taxes, saying that he needed to hold on the results of a couple of forthcoming studies, one of which is Gibson’s. Julie Anne Genter and the Greens have been arguing that his opposition relies on one industry-linked report; I’m not sure how they missed Gibson’s work, as I’ve pointed Julie to it many, many, many times. Gibson’s presentation at Motu goes beyond what I’d seen him present at the Ministry of Health a few months ago, and which we cited in Jenesa’s report The Health of the State. He walks slowly through the problems of demand elasticity estimation where there can be consumer response on the quality as well as quantity dimension when all you have is household expenditure data. Price variation on the quality dimension is huge. If you infer consumption by how much people spend, but people respond to price changes by downshifting in quality, you will overestimate the price elasticity of demand. And even more so if people stockpile when things are on sale for later consumption. 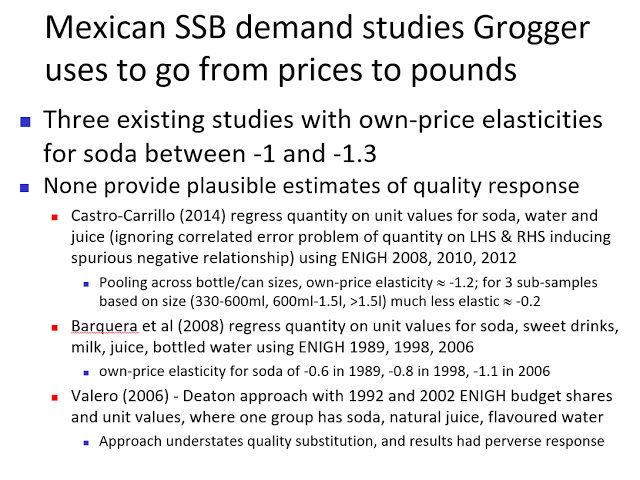 He shows how Deaton’s method of inferring price elasticity by restrictive assumptions on cross-brand shifting fails. Sugar tax advocates in New Zealand need to stop pretending this work isn’t going on. Gibson’s final report isn’t due out in a while. The sugar tax people can’t continue claiming that all the opposition to sugar taxes is somehow motivated by Big Sugar. There are serious empirical issues in the literature and I have pretty big doubts that any of the sugar tax proponents have been able to wrap their heads around those issues.